The Downtown Washington DC Ecodistrict claims the highest per capita concentration of green roofs, renewable energy contracts, Energy Star properties and buildings certified for Leadership in Energy and Environmental Design, or LEED. This ecodistrict is essentially the brand of the one-square mile Downtown DC Business Improvement District, formed in 1997. The BID’s mission goes well beyond beautification, and coordinated marketing in an effort to promote green development in general and energy efficiency in particular. In 2006 Washington DC became the first major US city to require LEED certification for all new buildings, public and private. The BID accepted the Cool Capital Challenge, pledging to help eliminate 71 million pounds of carbon emissions by 2009. The BID’s restating of the triple bottom line, Planet/People/Profits, recognizes the need to work collaboratively, going beyond individual buildings to create whole communities where people can live and play as well as work. In 2008, the BID launched Greening Downtown DC: Strategies for Protecting the Planet, People and Profits, an initiative aimed at greening new/existing buildings, training sustainability practices, enhancing public spaces and expanding transportation options. The BID stresses that sustainability is not only the right thing to do but also a path to greater employee productivity, reduced operating costs and, of course, higher rents. The BID uses the Willard Hotel as a role model for greening existing buildings. More than a century old, the Willard won the Mayor’s Environmental Excellence Award for decreasing electricity and water consumption, composting 37 tons of waste annually and relying entirely on wind energy. In 2010, the BID and the Urban Land Institute (ULI) co-hosted an EcoDistrict Summit that recognized the multiple benefits generated to that point by the sustainability initiatives and advocating a doubling down on those successes. Consequently, on Earth Day 2011, the BID formally established the DowntownDC Ecodistrict to accomplish its sustainability targets, including a 20 percent reduction in energy consumption by 2020 for its 90 million square feet of floor area. In 2014, ULI published a performance report indicating that the DowntownDC Ecodistrict continues to score impressive conservation victories and is on target to meet its energy reduction goals for 2020. In 2008, Washington DC launched the first bikeshare system in North America. Its successor, Capital Bikeshare, now offers 1,800 bikes at over 200 stations in Arlington County, Montgomery County and Alexandria as well as Washington DC. Downtown DC Business Improvement District. 2008. Greening Downtown DC: Strategies for Protecting the Planet, People and Profit: Downtown Leadership Paper. Washington, DC: Downtown DC BID. Downtown DC Business Improvement District. 2011. Downtown DC ecoDistrict: A 21st Century Sustainability Framework: Downtown Leadership Paper. Washington, DC: Downtown DC BID. Urban Land Institute. 2014. Metro Washington, D.C., Greenprint Performance Report. New York: ULI Greenprint Center for Building Performance. Washington, DC. 2009. Case Study – Willard Intercontinental Hotel. Washington, DC: District Department of the Environment. 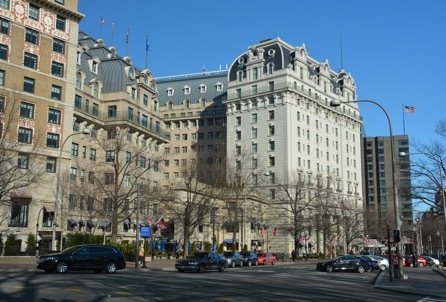 Retrieved March 5, 2015 from http://ddoe.dc.gov/service/case-study-willard-intercontinental-hotel. Washington, DC. 2015. Case Study – Downtown DC. Washington, DC: District Department of the Environment. Retrieved January 20, 2015 from http://ddoe.dc.gov/page/case-study-downtowndc.